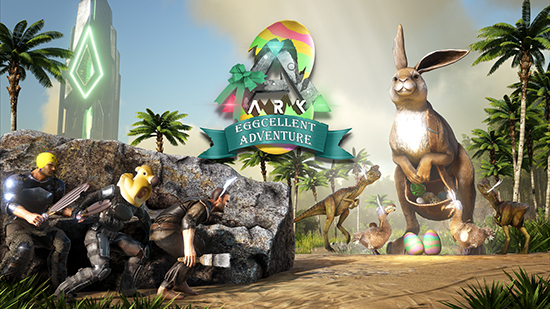 The Eggcellent Adventure has returned to ARK along with giant Bunnies! Today kicks off a two-week in-game event in ARK: Survival Evolved where special Easter Eggs will be scattered across all official ARK maps. This fourth annual event features all the festive items from prior years along with two new skins, the Marshmallow Dodo Hat and the Chocolate Bunny Club! During the Eggcellent Adventure, survivors will search to collect special Bunny Eggs from wild Bunny Dodos! Place down these Bunny Eggs to paint on them or use them in a special Cooking Pot to craft holiday-themed cosmetics (Bunny Ears Skin, Procoptodon Bunny Costume, Egg Shell Hat, Chick Hat), including the Marshmallow Dodo Hat and the Chocolate Bunny Club. Also, watch out for the Bunny Oviraptors which will drop Easter dino candy that gives your favourite tame random dino colours when eaten! Artistic survivors can participate in the community egg-painting contest! After hunting down a Bunny Dodo grab an egg, take out your paint brush and dyes then use it as your canvas to show off your most eggcellent work!